A benchmark consumer (district) can view and filter benchmarks created by TE21, but they cannot edit or clone them. Only the district that the benchmark has been assigned to will be able to view it. 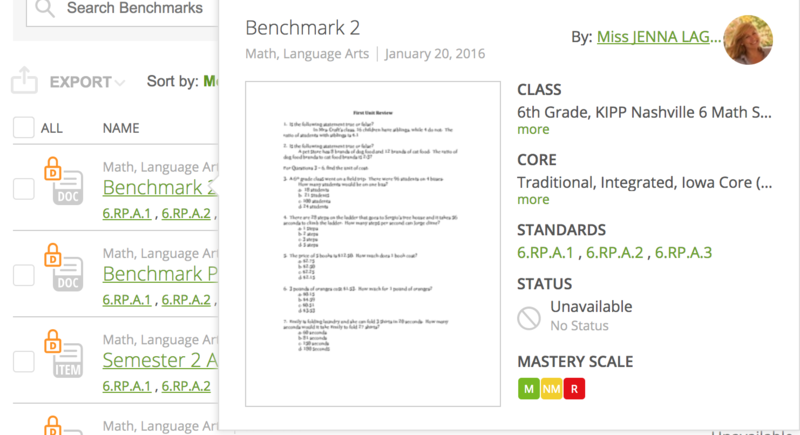 Click on Admin, hover-over Assessments, and then click on Benchmarks. In the Benchmark Assessment list, hover over the benchmark name and you will be able to see information about the benchmark, such as the standard, who created it, which district it was created for, and whether or not it is available. Click on the Manage button next to the benchmark that you want to manage. On the Availability tab, you can turn the benchmark on or off for a certain school, view benchmark progress, delete all assessed scores from a tracker, or remove the benchmark from a specific tracker. On the View Reports tab, you can view a bar graph of student mastery for the benchmark. Select the Exclude No Scores checkbox to exclude assessments that do not have scores yet.